Industrial electric fuses cannot be sent by an ordinary postal service. Thus, it's difficult to obtain them in many regions. One of the plentiful methods of independent production of electric fuses is described herein. It's necessary to pass the industrial safety instruction, seeking to get involved in occupational work with pyrotechnics! Usually these courses continue within several days; please, address the fire-prevention safety service for information. 4) a petard or a small festal firework. The tools: The wire cutters, a soldering iron, the solder and a fire-extinguisher. 1) Cut the cable in segments, making 0,5 m each. Remove 3 mm of insulation from one end of the cable. 2) Solder the resistor between two bare ends. The wires should be twisted in such a way, so as to avoid contacting of the bare ends of the wire without the resistor because the resistor may fall off after burning. 3) Remove sulphur from all the matches. Use the wire cutters or the knife, or the wire stripping tool. 4) Dissolve sulphur in water. It's necessary to achieve a rich mass. If sulphur dissolves badly, then buy the other matches. 5) Get the black smoke gunpowder out of the petard. An ordinary petard: it's the powder in the paper packing, plus the slow-match. 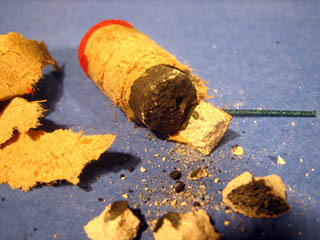 The black gunpowder in rockets is compressed, but is easily crumbled. The cement or the clay, out of which the nozzle is made in the rocket, or the caps in the petard should be thrown away. The fine powder of the black gunpowder is necessary. The black gunpowder is resistant towards hits and rubbing, however, it easily blazes up from the open fire. Don't keep more than several grams of the gunfire in Your place of work. The black gunpowder is substituted with other compositions in certain pyrotechnics. 6) Dip the resistor, soldered to the wire, firstly into the sulphur solution and then into the dry powder of the gunpowder. 7) Bend the opposite end of the wire in the shape of a hook and hang the fuse to dry. 8) The fuse may be used after several hours. Production of 200 fuses will take one day. 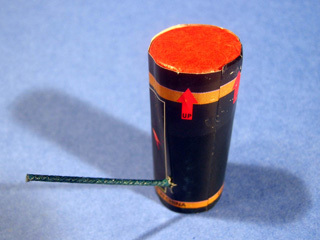 The speed of ignition of such fuses is approximately the same as ignition of the industrial fuses, meant for rocket models. The price of home-made fuses is cheaper than the price of industrial fuses by 20 times. With taking into consideration the prices of the year 2008, You will save more than 100 EUR. One more method for producing ignitors is based on using nichrome wire. Nichrome wire can be found in various electric heating devices. The most suitable diameter of nichrome wire is 0,2 mm. Combustion current of such wire is about 3A. Please, measure the resistance of the nichrome wire and the find the length of its fragment required for one ignitor. The resistance of such ignitor should be 1-3 Ohm.